I'm realizing one thing I like about these masks is the speed of them. 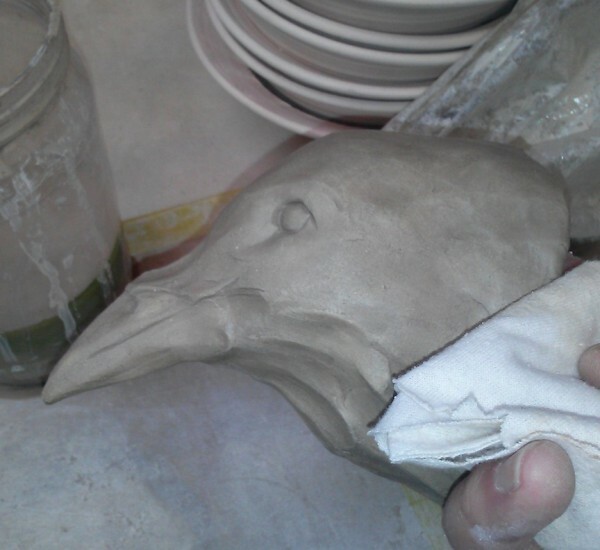 When I'm working on my usual sculpture, I need an idea, a story, and a good week to work on it. When I'm throwing pots, I have to make enough to fill a 50 cubic foot car kiln. I can't fire more frequently than every six weeks or so. Masks are fast. I can make two or three in an afternoon, and they don't have to be anything more significant than wouldn't it be cool to-- I can fit them in the bisque around the usual load of pots, and I can fire my little brick pit kiln with only a few pieces in it, and fire it fast. I fired it twice yesterday, a mere two days before Clay Fest. Back in the summer of 1985, I took a workshop at Pigeon Lake Field Station in northern Wisconsin on Raku and Primitive Firing. 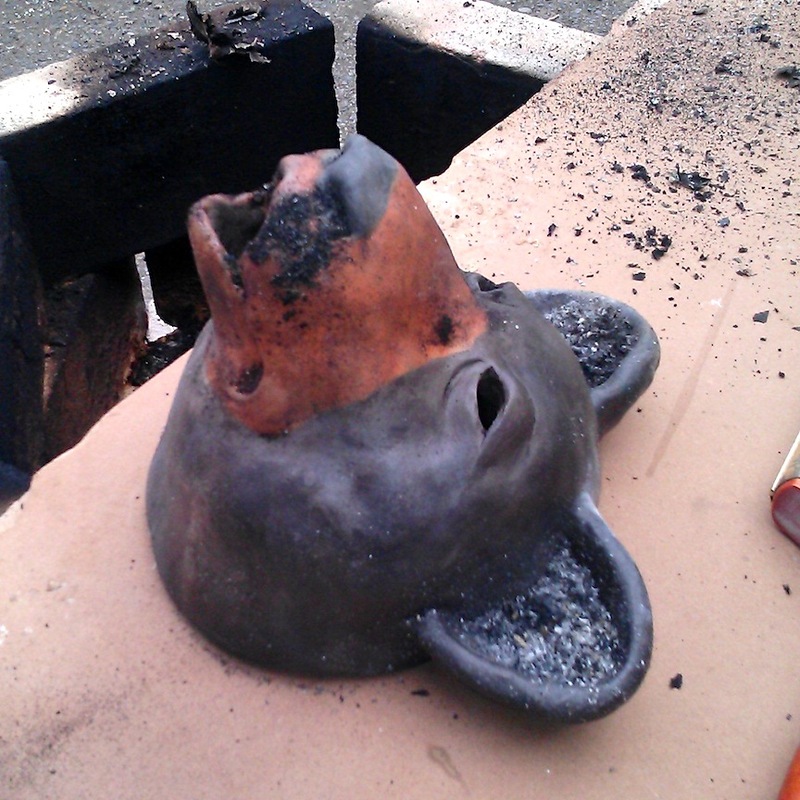 We made pots, burnished pots, covered them in terra sigillata, and pit-fired them in a variety of situations, from actual holes in the ground to brick boxes to nested steel drums. The resulting pieces weren't functional by any means, but they were gorgeous. 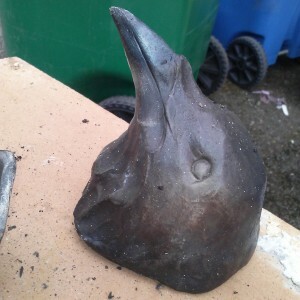 I've played with the techniques from time to time over the years: wrote an instructional manual in grad school, taught a course a few times at the Craft Center, and most recently, unearthed the skills and tools to make small sculptural animal masks. Terra sigillata, Latin for painted earth, is a very fine clay slip used decoratively on the surfaces of low-temperature pots. Terra sig is made from a very fine particle clay like ball clay or earthenware, mixed to a very thin consistency and deflocculated to keep the particles suspended. Over time, all but the very finest particles settle on the bottom, at which point the remaining liquid is carefully decanted or siphoned off and kept, and the thicker stuff on the bottom is discarded. I apply four or five coats of terra sig by brush to bone dry ware, waiting for the wet shine to disappear between applications. After the last coat, while it still looks leather-hard, I buff the surface with a soft cloth--old t-shirts or worn-out flannel jammies work well. 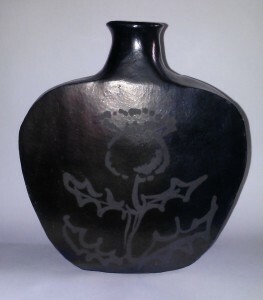 The result is a waxy shine that can be enhanced if the pot is burnished beforehand. Clay particles are very tiny plates, and by burnishing the surface of a pot with a polished stone or metal spoon, you can make them line up with one another resulting in quite a glossy surface. Greek red-and-black ware uses terra sig; so does Native American blackware and colored Pueblo pottery. Low-temperature firing in sawdust smokers or pit kilns gives the best shine. Even at the comparatively low temperature of a bisque firing, clay particles start moving out of alignment, negatively affecting the shine. 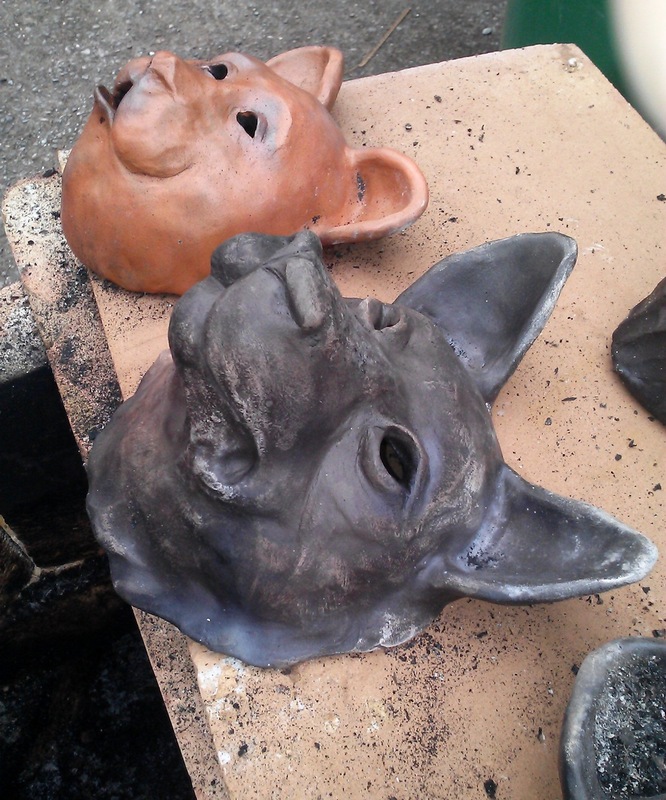 Been playing around with masks again, partly from an order, partly just for the fun of it. I made a couple last spring, thanks to the Oregon Potters Association. 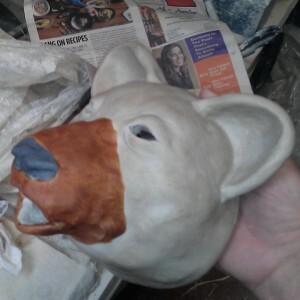 Their charity project at Ceramic Showcase was a mask installation, and making a bear mask for them has gotten me inspired. 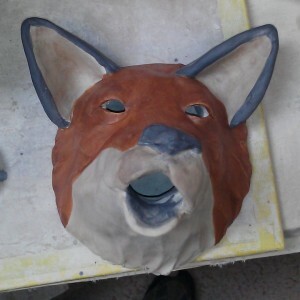 Of the first three I made after Showcase, the cat and fox mask have been purchased, and I've a request for a bear and wolf to go with the fox. And masks are a fun, not-too-time consuming way to play with clay and sculpture when I'm not motivated to be otherwise productive. So I've taken some of the hard brick that I'm supposed to be using to build a stoneware kiln and made a pit fire smoker instead. I've scrounged some sawdust from the UO Craft Center, mixed up a couple of terra sigillatas, and have half a dozen masks to finish before Clay Fest. The red terra sigillata is mixed from a native earthenware clay I dug some years ago on the family farm in Wisconsin. It takes a very nice shine, and fires pumpkin orange. The grey one is plain old ball clay. It bisques white, but in a heavy smoke fire, will absorb carbon and become grey or black. I've also mixed up a little bottle of sig with black stain. It doesn't polish up nearly as well, because the stain particles are neither very fine or very platelike, but it guarantees me black on places like fox ears and noses.